Weather forecasts in real time, internet, Pay per view, TV on demand, etc are all part of that package of services we have become accustomed to thanks to the so-called new technologies and which by now we would find hard to do without. In fact for some they have become more of a necessity than a habit, services that an increasing number of users want to access wherever they are, even during a cruise on their boat for example. The world of on board satellite aerials - Locatori told us - is effectively one that has undergone truly enormous technology- linked development, which in the mere space of a year has led us to reach important new goals. What is the most significant aspect of this growth? We make heavy investment in research, around 7% of our turnover, in an attempt to offer aerials that are increasingly more efficient from all aspects. 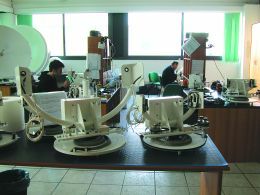 Each single component of our apparatus is undergoing continual studies aimed at reaching a level of absolute reliability in both the quality of materials used and the package of services that can be supplied, in addition to simple TV reception, which can be used practically anywhere the boat is. Let us say that it is exactly this aspect that has recently received greatest input seeing that with our aerials we can by now ensure ever-wider satellite cover. A French or Greek client for example is today able to make use of all services connected to the wide band satellite signal, which for speed and quality of connection are often superior to the normal land networks accessible from home, even when they sail far from the coasts of their countries, practically anywhere in the Mediterranean basin. The most interesting thing though is that now we can offer the same service of cover even if you decide to take the same boat elsewhere, to America or Asia maybe, without anyone having to alter the system afterwards, aerial included, nor touch a wire or a connector, through the simple push of a button on the remote control. All that's needed is a slightly bigger aerial; let's say from 90 cm diameter up, but with amazing advantages. Here we are talking about super yachts where space is not a problem, even for the installation of two "radomes" containing the same number of our aerials working "in parallel", in this way the satellite system becomes absolutely fantastic as the owner can use the wide band for entertainment at the same time as all the other services currently available with this communication system: super fast internet downloads - 2.5 Megabytes a second for the joy of those who download films from the net - while on board televisions continue to transmit programmes simultaneously from both Astra and Hot Bird, right in the middle of a videoconference organised with people at the other ends of the earth, etc. The possibilities for use of this communications system thus become enormous, with maximum cover and an extremely high level of reliability, guaranteed by our search and tracking systems and above all signal maintenance. So, home, office or boat, there is no longer any difference in terms of usability for certain types of services? This is true above all for super-yachts, in fact I reiterate that land connections are at times undoubtedly less efficient. 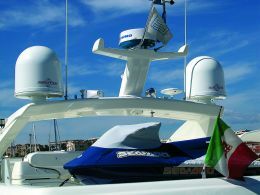 For further information: Navisystem Marine Electronics; via Fondacci, 269; Z.I. Montrami; 55054 Massarosa (LU); tel. 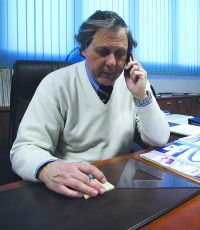 +39 0584 425454; fax +39 0584 434386; web site www.navisystem.com; e-mail info@navisystem.com.